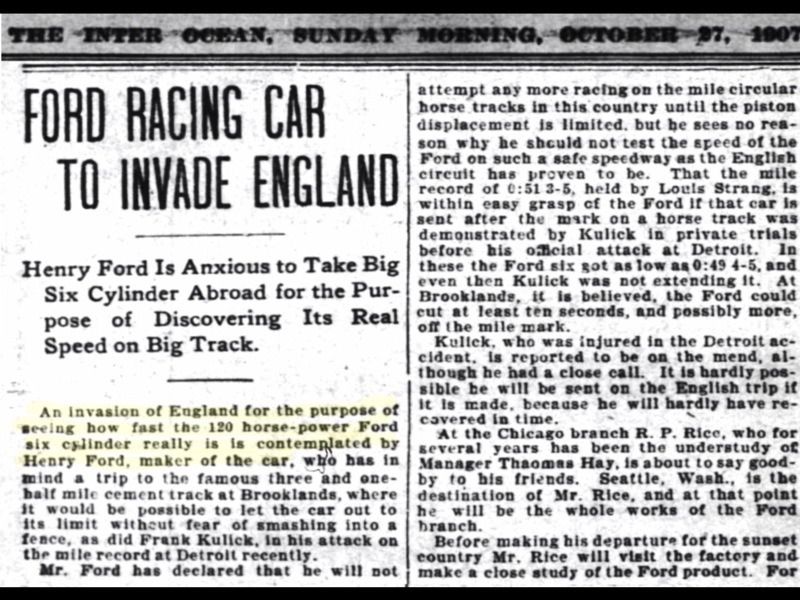 "In October 1907, Frank Kulick – Ford’s first factory racing driver and a close friend of Henry Ford’s – found himself hurtling toward the outside wall of the track at the Michigan State Fairgrounds in a big six-cylinder Ford Model K-based racer. Kulick survived the ensuing crash, barely, escaping with his life and a severely broken leg. In response, Henry Ford himself scrapped the car, withdrew from all racing activities for the next couple of years, and decreed Ford would never build a six-cylinder car again. ........... more at: http://blog.hemmings.com/index.php/2012/07/24/edsel-fords-six-cylinder-model-t-s peedster-heads-to-auction/#comments Edsels 6cyl speedster." Warwick went on to write: "How many incorrect opinions are reinforced as fact just because they are in print and have been passed on for the last 40 to 50 years?" Henry Ford's first announcement (that I've found) of the six cylinder racer came in December 1904 when Ford said he would attempt to go two miles in 60 seconds, setting a new world's record at Ormond Beach (Daytona) in January 1905. At Ormond, while going through trials with the racer, the crankshaft broke, and the racer was not available for any time trials. Ford repaired and revamped the racer, and prepared for several race events in the summer of 1905. In August at Cape May, the racer tied the existing one kilometer record. However, Walter Christie, the record holder, beat his own record, so the Ford racer did not make the record books. Then, in September 1905, at Ventnor Beach, the Ford racer set a world's record beating a Darracq driven by A.L. Cambell for the Mile Competition Record. However, while it would not have affected the time, Cambell filed a protest because the Ford crossed the start line (rolling start) before the Darracq. The judges upheld the protest, denying Ford the record. 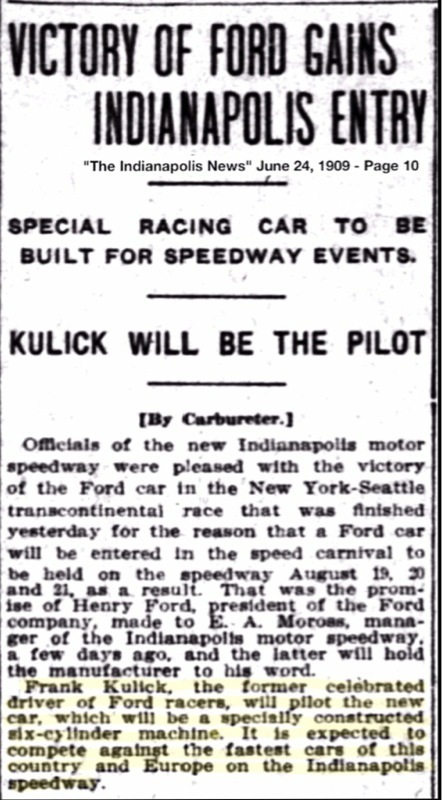 I've not found any reports of the racer again until the summer of 1907, when it's reported Frank Kulick will drive the racer in the Vanderbilt Cup Race. The report says it's a new version of the racer, with many improvements. The racer doesn't make the race (I don't think the Vanderbilt was held that year, but not sure). Later that summer the media reports Henry Ford is preparing the racer to "attack all records". 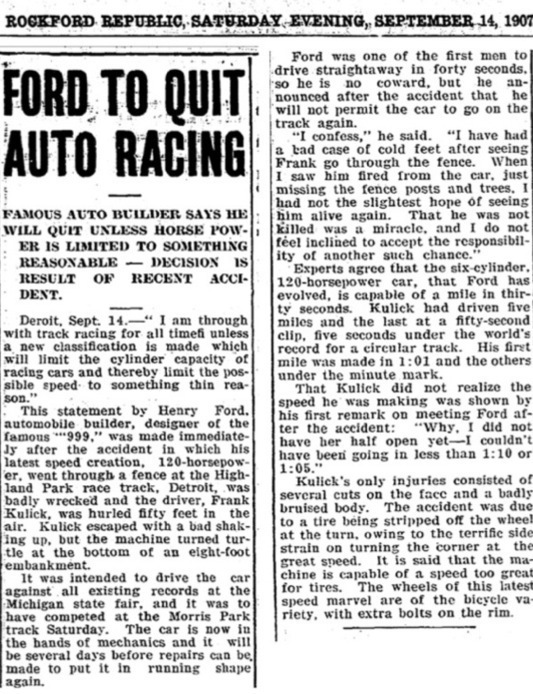 Following this wreck, Henry Ford declares he will "quite auto racing." Henry Ford again says he is through with racing. 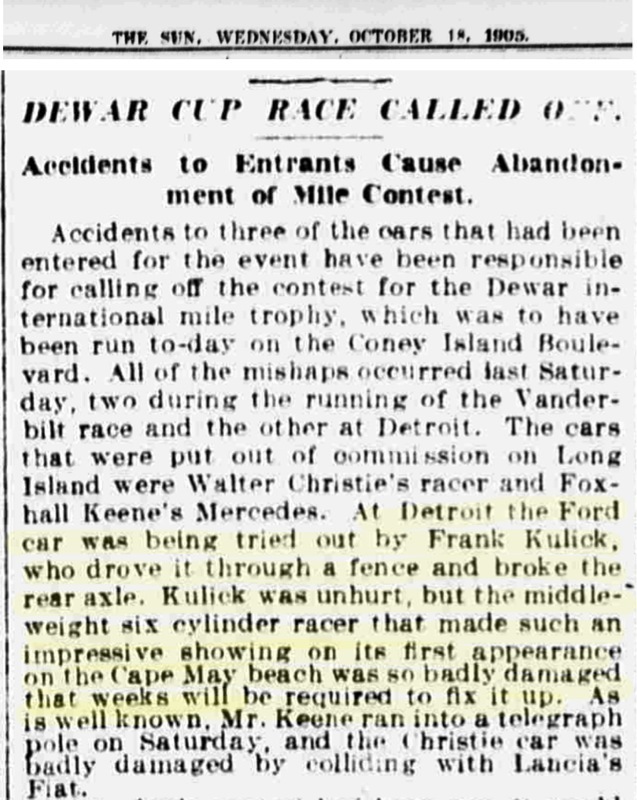 Most historians report this wreck, and many say Ford does not race again, or not until the Ford Special in 1910-1912. Another important thing this article mentions is that Ford has a second racer. In 1908, Ford agains says he will race the six cylinder again. One race he says the car will run in is the Grand Prize race in Savannah GA on Thanksgiving Day 1908. However, the racer does not make the race. The racer did not make the race (although as late as August 9th the car was still scheduled). As a result of this continued on and off again with the Six Cylinder Racer, one can safely assume Henry Ford is not yet "disillusioned" with the six cylinder.